19 x 34.8 mm by 7 mm thick 18K pink gold case set with diamonds, octagonal in 18K pink gold crown decorated with a diamond, mineral crystal, silver dial with Roman numerals and sword shaped blued-steel hands, caliber Cartier 157 quartz movement, 18K pink gold bracelet set with diamonds. Water resistant to 30 meters. Small size, 18K pink gold case, silver dial, quartz movement, alligator strap with 18K gold tang type buckle. Water resistant to 30 meters (100 feet). 19 x 34.8 mm by 7 mm thick 18K pink gold case, octagonal in 18K pink gold crown decorated with a sapphire, sapphire crystal, silver dial with Roman numerals and sword shaped blued-steel hands, caliber Cartier 157 quartz movement, 18K pink gold bracelet. Water resistant to 30 meters. 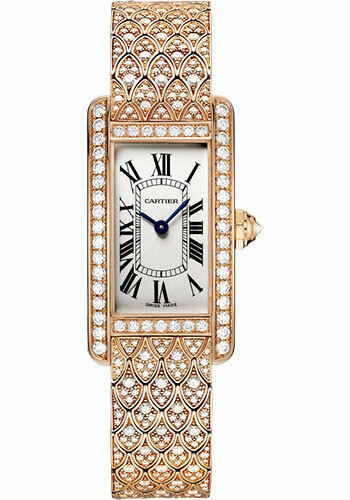 Small size, 18K pink gold case set with diamonds, silver dial, quartz movement, 18K pink gold bracelet. Water resistant to 30 meters (100 feet). 19 x 34.8 mm by 7 mm thick 18K pink gold case set with diamonds, octagonal in 18K pink gold crown decorated with a diamond, mineral crystal, silver dial with Roman numerals and sword shaped blued-steel hands, caliber Cartier 157 quartz movement, 18K pink gold bracelet. Water resistant to 30 meters. 34.8mm x 19mm 18K pink gold case with brilliant cut diamonds, 7.34mm thick, 9-sided crown with a diamond, sapphire crystal, silvered dial with blued-steel sword-shaped hands, quartz movement, brown alligator skin strap, 18K pink gold double adjustable folding buckle. Water resistant to 30 meters.